If you’ve abused alcohol for a number of consecutive days, months or years, the cumulative impact all that alcohol has on your body can dramatically increase the levels of dopamine within your brain — that’s the neurotransmitter associated with pleasurable feelings like euphoria, relaxation and satisfaction. Given that alcohol stimulates dopamine within the brain, it’s easy to understand why drinking alcohol tends to make people feel more relaxed, empowered and happy — and it’s also the reason why alcohol withdrawal is associated with seizures. Drinking large quantities of alcohol over a period of time tends to keep dopamine levels at a constantly elevated state within the brain, and the brain adapts to these new, elevated levels and stops producing dopamine naturally. Simply put, your brain becomes chemically dependent upon the high levels of dopamine that result from heavy drinking — when you suddenly stop drinking, the chemical balance in your brain is dramatically altered, leading to severe withdrawal symptoms that can include seizures. How Common Are Alcohol Withdrawal Seizures? According to the Government of South Australia’s National Health Service, approximately 15 percent of people who suddenly stop, or dramatically reduce, their alcohol intake following a prolonged period of excessive use will suffer from seizures. In most cases, alcohol withdrawal seizures happen within one to three days following the person’s last drink and, like all types of seizures, are caused by a disruption in the communication pathways in the brain. Are Alcohol Withdrawal Seizures Dangerous? Seizures are broadly defined as “the physical findings or changes in behavior that occur after an episode of abnormal electrical activity in the brain.” Also commonly referred to as a convulsion, seizures are characterized by rapid, uncontrollable movements of muscles throughout the body. When most people think of a seizure they picture what is known as a grand mal seizure — this is when a person suffers from violent muscle contractions that cause a brief loss of consciousness. People who experience a grand mal type of seizure may also scream out uncontrollably, lose bladder and bowel continence or be confused for a period of time following the seizure. They can also suffer from extreme fatigue and a migraine-like headache once the muscle contractions have stopped. In the case of alcohol withdrawal seizures, the abrupt elimination of alcohol intake causes chaos within your brain, leading to sudden changes in your brain’s electrical activity. People who experience alcohol withdrawal seizures can have a wide range of symptoms, ranging from a mild loss of consciousness (blackout) along with brief periods of erratic eye movements, shaking, drooling and teeth clenching right up to the symptoms associated with a grand mal seizure. The severity, frequency and duration of alcohol withdrawal seizures is highly variable, with some detoxing patients experiencing a number of seizures, while the majority of people who detox from alcohol never actually have a seizure during their detox. Medically assisted detox has long been the gold standard of care for people who are addicted to alcohol, simply because detoxing from alcohol can cause the sudden onset of a wide range of symptoms that can be life-threatening. Generally speaking, it can take anywhere from one to two weeks for the residual alcohol to be completely flushed from your system and your body’s normal functions to be restored. However, for some people, the detox stage is even longer. During this time, your body goes through a number of dramatic changes that tend to begin within eight hours of taking your last drink of alcohol. Within the first 24 hours of detox, you may experience nausea, anxiety and abdominal discomfort, while symptoms such as elevated heart rate and high blood pressure, confusion and excessive sweating tend to begin within 24 to 72 hours. The risk of experiencing alcohol withdrawal seizures is highest within 48 to 96 hours after quitting alcohol, as are the chances of suffering from severe agitation and vivid hallucinations. Unfortunately, medical doctors and addiction experts have no way of accurately predicting which people will experience which symptoms or what the severity of those symptoms will be. While there is a known link between the severity of withdrawal symptoms and the occurrence of alcohol withdrawal seizures with the use of other drugs in conjunction with alcohol, other factors like family and medical history, the presence of a co-occurring mental illness, previous attempts at detox and stress levels can all impact how a person will experience alcohol withdrawal. Medical detox is highly recommended for anyone who has an alcohol abuse disorder in order to monitor the rapidly changing physical symptoms of detox, provide treatment for the symptoms and help reduce the risk of serious complications during the process. A variety of medical detox protocols are used to both treat and prevent problems like dehydration, nausea, and seizures, and benzodiazepines are commonly administered during alcohol detox to help minimize overactivity within the nervous system. Vital signs such as blood pressure, heart rate, and body temperature are also closely monitored by detox center staff since sudden changes in any of these readings can quickly lead to medical distress. 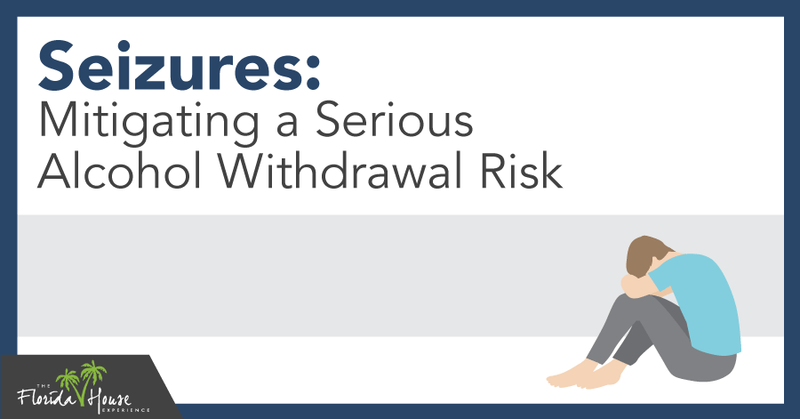 Although it’s impossible to completely eliminate the risk of seizures during alcohol withdrawal, checking into a medical detox facility can dramatically reduce the risk of suffering severe, life-threatening alcohol withdrawal symptoms during the detox period. The first step towards taking control over your life is admitting you need help dealing with your alcohol abuse. Here at FHE Health, we know what it takes to get started on the road to recovery and the support you need to stay sober. Call us today to speak with one of our compassionate addiction and mental health experts about how we can help you with our accredited inpatient medical detox services, our addiction treatment programs and our structured sober living residences.